I compared Jim Lahey's technique for no-knead bread with Jeff Hertzberg and Zoe Francois' Boule recipe from their book Artisan Bread in Five Minutes a Day (St. Martin's Press). Both breads have very little hands-on time but some very distinct differences, which are illustrated in the following steps. I also looked at a 100% Whole Wheat Sandwich Bread recipe published by King Arthur Flour. Jim Lahey is the owner of Sullivan Street Bakery in New York City and has developed a minimalist approach to making good bread, easily at home. His widely publicized ​recipe is found here and contains just four ingredients; flour, water, salt, and yeast. I followed the recipe by mixing up the four ingredients (I used regular, all-purpose flour) and letting the dough sit on the counter overnight, covered with plastic wrap. The next day, I plopped the dough onto a heavily floured counter and folded it two times. Then I gathered up the four (or more edges) into a ball and moved the whole ball to a floured dishcloth. Not enough flour, apparently, because the dough stuck to the cloth when I tried to dump it into the pot. The dough rose for two hours. For the last half an hour, I preheated the oven to 450°F with my 3-quart cast iron pot and lid inside. I removed the pot from the oven and rolled the dough into it, no grease or extra flour. The lid was set back on the pot and it went back into the oven for 30 minutes, as per instructions. To finish baking, I removed the lid and baked for 15 minutes longer. Result: The bread popped out of the pan with no problem, all sides were crusty and beautifully brown and the crumb was big and open, with a nice chew. The taste was great, probably from the long rise. As a comparative experiment, I ran these loaves side by side on the same day with the same flour, salt, and yeasts. The doughs looked very similar, but the "Artisan Bread…" Boule dough took several teaspoons of yeast, while Lahey's loaf calls for just 1/4 teaspoon. The "Artisan Bread…" dough therefore rose and fell within three hours, while the Lahey dough took the full 18 to show significant yeast activity. Then you cut off a grapefruit-sized section (shown here) and shape it, placing it on a peel or parchment, before letting it rise. The rest of the dough you can put back in the refrigerator for later on in the week. 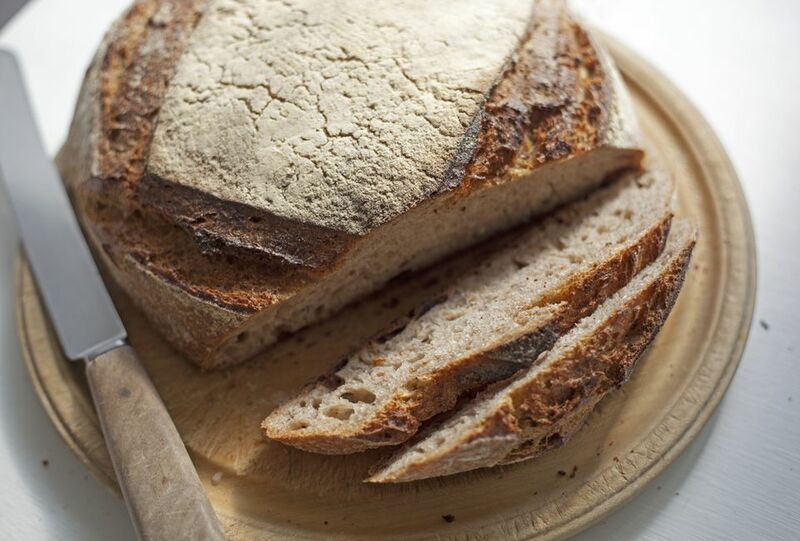 Find recipes for these breads in this Mother Earth News article. The other differences between the loaves were baking styles and temperatures. Both take about 2 1/2 hours to rise and bake on the second day and both are quite messy in terms of flour, hands, and slack dough. The Lahey bread bakes in a preheated pot at 450°F while the "Artisan Bread…" bakes at 450°F on a preheated baking stone dusted with flour or cornmeal. The taste of "Artisan Bread…" loaf was slightly flatter than the Lahey loaf. This could be due to temperature of the dough, amount of yeast or salt, as well as preconceived ideas (I was expecting this loaf to fail miserably, which it did not - it was a good loaf of bread). The crust of both loaves was hard and crunchy, but the "Artisan Bread…" loaf had a tighter crumb, which is not what we have come to associate with artisan bread (rightly or wrongly). I would make the Lahey loaf again, simply because the shaping and baking was a little easier. I am also intrigued by the enriched bread recipes in the Artisan Bread in Five Minutes a Day (St. Martin's Press) and will try one or two of those out. You might also be interested in a third kind of no-knead bread I made, 100% Whole Wheat Sandwich Bread. If so, read on. Also, see Step 10 for Bonus Information. The third bread was the King Arthur Flour recipe for 100% Whole Wheat No-Knead Sandwich Bread. This bread is mixed (preferably in a stand mixer) for three minutes, turned straight into a loaf pan, allowed to rise, then baked at 350°F for about 40 minutes. I used King Arthur White Whole Wheat flour. This was the easiest bread of the bunch, and it was ready to bake in about 90 minutes. It had good flavor, good rise and held together moderately well. However, it is a sandwich loaf, which naturally has a tighter crumb. We judged that the crumb was accepting of eggs for French toast and made good melted cheese sandwiches. My husband has requested that this bread be made often. So, Is It Worth It To Bake No-Knead Breads? End Results: I really like the open structure and ease of baking of the Lahey loaf over the "Artisan Bread…" loaf, but the "Artisan Bread…" loaf was good and the book has many variations to try. Both loaves were messy on the counter top and both loaves do well eaten warm. The 100% Whole Wheat No-Knead Sandwich Bread was the big surprise but cannot be compared to the other two, since it is a sandwich bread with different characteristics. See Step 10 for Bonus Information especially relevant to people who love German Hard Rolls. Added Bonus: For those of you looking for really crusty rolls like they make in Germany, I stumbled upon a neat trick for making them. I had cut off a bit of the Lahey dough because my pan was smaller than called for and being the frugal person I am, I decided to bake the extra. I placed a CorningWare 16-oz. ramekins in the oven to preheat with the pot and place the 1/2 cup or so of leftover dough in it. Back in the oven for 25 minutes (without a lid) and I had a large "Brötchen" that just popped out of the cup, as crusty as I ever had them in Germany! If you had enough ramekins, Lahey's recipe would make 5 or 6 rolls. Compare Prices of CorningWare 16-ounce dishes here.